Scrappy teenager Rainy Cain knows how to fend for herself even though she’s still in high school. She manages to be independent and to present herself a certain way so that no one will ask too many questions. She’s been through an awful lot in her life and she’s yet to graduate from high school. She’s developed protective coping mechanisms that enable her survival. Her severely mentally ill mother neglected her long ago. They still live in the same house but don’t communicate with each other (sounds like me and my stepfather). After her mother commits suicide, Rainy’s felon father, recently released from prison, kidnaps her in hopes that she’ll lead him to money that he believes her mother hid when he was sent off to prison for a series of armed robberies. He’s a violent, ruthless man. Rainy wasn’t even aware he existed. Blaine, a seemingly good guy and police officer, with more in common with Rainy than one might suspect, pursues them. I love this sentence about Blaine: “His interior was this packed, cluttered museum of guilt and regret.” Author Gina Wohlsdorf spent a decade writing the novel. When she started she wasn’t that much older than her central character, strong-willed and determined feminist Rainy. As I dove into this thriller, which really skirts into horror, I didn’t know what was going on for quite a bit but the compelling writing kept me reading. There’s a cinematic edginess to the characters and this riveting and scary cross-country chase. FTC Disclosure: I received this book for review from Algonquin. While on assignment in India, Clare, an international journalist, becomes stricken by an illness which destroys her memory. Once back in the states she’s forced to rely on her husband Charlie and her best friend Rachel to reconstruct the past and her memories. Does she remember specifics of her marriage and her friendship, the things that sustain these relationships? Claire senses that something isn’t right but doesn’t know if it’s her marriage or her friendship or a combination. Can she even trust Charlie and Rachel. The novel is effectively told in different points of view and jumps back and forth from present to past and back again. I spoke with author Joanna Luloff by phone earlier this month. Amy Steele: Where did you get the idea for this novel? Joanna Luloff: My mom and I talked about her memory loss and how she had to borrow other people’s memories. A lot of years later when I was actually in graduate school, we started to have this correspondence where I would send her a photograph and I’d ask her what she saw in it and she’d do the same for me. I also did an experimental project for a class that I was taking. I became more interested in the people surrounding someone with memory loss and how it affects them. To lose the confirmation from other people. The story got shifted away from just a person with memory loss to those people surrounding that person and it started to shift away from my family into fictional characters and what it meant to gradually recover their love for each other and the secrets and all this conflict. Amy Steele: A lot of times you want to let things go from the past and live in the present but obviously there are certain connections which affect how you’re fitting in with certain people. Joanna Luloff: The idea that memory is very subjective anyway. We frame the story as we remember it. My brother and I have very different recollections of the same event. As a fiction writer, I love to elaborate and add to the story. I know my stories are often changed through imagination. Sometimes I think you can rewrite and event or create the situation you’d want to have or rework a situation/ investigate it. Amy Steele: Did you prefer writing a certain character? Joanna Luloff: I probably had the easiest time writing Rachel’s character because she gets to be an observer and be on neutral ground but she also has her own secrets. She sees so much so it was fun. And Charlie might have been the hardest because he’s a man from England. I lived in England for a really short time and I was really struck by the reserved politeness and stoicism. I tried to channel a bit of that restraint which British men seem to have. Amy Steele: Do you think writing his character was the greatest challenge in the overall writing of the novel? Joanna Luloff: I think the biggest challenge I had was not about character or voice but the structure. I needed to figure out the story’s chronology. For Claire, obviously her memories were super jumbled and the characters are constantly moving from the present to the past. My first drafts of the novel were disjointed. Amy Steele: I was skeptical of everyone involved. How do you organize? How long did it take you to write the novel? Joanna Luloff: It didn’t take me a long time to write the first draft. I was at least able to knock out the basic foundation of the book. It was a lot of revisions and layering in the mystery or base suspicion of what the truth might be. I wrote it out longhand and it worked out well because I was able to rip out pages and lay them out on the floor and play around with what needed to go where and I think it helped to be able to see it in different forms. Once that was in place then I did some adding and subtracting where I thought there needed to be more questioning of the character. I was able to play a bit more with how much the characters were withholding from each other, why they were doing that, all the secrecies and the past injuries to layer in eventually. Joanna Luloff received her MFA from Emerson College and her PhD from University of Missouri. She teaches at the University of Colorado. She’ll be appearing at Harvard Book Store on Monday, July 16, 2018. An intense mediation on race, culture, identity, sense of place and belonging, The Leavers by Lisa Ko is a gorgeous and thoughtfully written debut novel that should resonate with progressives and allow others insight into the struggles of undocumented immigrants. It’s not that they don’t want to follow protocol. It’s often that they have few choices. It’s the story of what happens when Deming Guo’s mother Polly, an undocumented Chinese immigrant, fails to return from her job at a nail salon. She just vanishes. She doesn’t contact the family. No one knows if she’s been deported or if she just took off. As a single mother she struggled to cover expenses as a nail technician. After a month or so, her boyfriend’s sister sends Deming off to a foster home in the suburbs where two dogged white professors adopt Deming and change his name to Daniel Wilkinson. They mean well and want Daniel to have the best educational opportunities afforded to him. They want him to have choices for his future. The story’s told from Daniel’s perspective as well as that of his mother Polly. Daniel struggles to fit in at this white enclave in upstate New York. He doesn’t do well in school and he develops a gambling problem. His parents aren’t happy and Daniel moves to Manhattan to live with a friend and join his band. Although Daniel is now in his late teens he still wonders why his mother abandoned him and never tried to find him. This definitely affects the relationship with his parents as well as his ability to figure out where he fits in. He often thinks about his birth mother and wonders why she doesn’t care enough about him to track him down. That’s enough to make a young man become wayward and develop a gambling addiction. In the United States, Polly had created a challenging but routine life for herself. She lived with her son and a boyfriend named Leon. Ko writes: “I didn’t want a small, resigned life, but I also craved certainty, safety. I considered suggesting to Leon that we marry other people, legal citizens, for the papers, and after a few years we could divorce our spouses and marry each other.” Now back in her homeland China, she lives a rather comfortable life working as an English teacher. She’s married and lives in a nice apartment. Readers also finally discover what happened when Polly went to work that day at the nail salon. Polly went through a horrific ordeal after ICE placed her in a camp for illegal immigrants. The harsh and nearly inhumane conditions could easily break someone down. It was shocking to read about these middle-of-nowhere holding facilites. Just harsh. Debut author Lisa Ko said that this novel was inspired by real-life stories of undocumented immigrant women whose United States-born children were ultimately taken from them and raised by American families. She states: “With The Leavers, I want to decenter the narrative of transracial adoption away from that of the adoptive parents.” It’s an important topic when our current president wants to keep people from entering the country as well as crack down on undocumented immigrants, even ones living quiet hard-working lives who have young American-born children. READ THIS NOVEL. It provides insight and empathy in the plight of immigrants in this country. It’s utterly heartbreaking yet often optimistic and shows resilience among the characters. I can’t recommend this novel enough. Lisa Ko utilizes lovely prose, a riveting story-line and relatable, flawed characters to highlight the challenges immigrants face today. Lisa Ko will be reading at Harvard Book Store on Wednesday, May 17 at 7pm. Beautiful cover and topical themes– millennials caught in the cross-fire of war and economics– drew me to this novel. Jessica is an Air Force drone pilot in Nevada. She drops bombs on terrorists, sometimes killing civilians in the process. Author Ron Childress writes: “Jessica had always charted her long-term future like a psychic predicting happiness: a disciplined twenty years would culminate in a military pension and return her to her beachside hometown in Florida.” Wall Street analyst Ethan works on an algorithm to allow his company to profit from terrorist activities. Childress writes: “This is what makes him useful to UIB: his combination of technical skill and real-world imagination, his ability to see connections that neither the pure programmer nor the pure trader is likely to see. He binges on coffee and Provigil to keep alert.” The global ramifications for both Jessica and Ethan prove intense, catastrophic and scary. In this debut novel, author Ron Childress convincingly writes about the military, the financial world and today’s millennials. This is the first novel by Childress who left the tech marketing agency he founded with his wife in 2000 to pursue a writing career. He’d earned his bachelors, masters and PhD in literature. Before founding the company he worked as a communications manager. I appreciate this bio because many of us with English degrees and aspirations to write novels or memoirs work in communications. 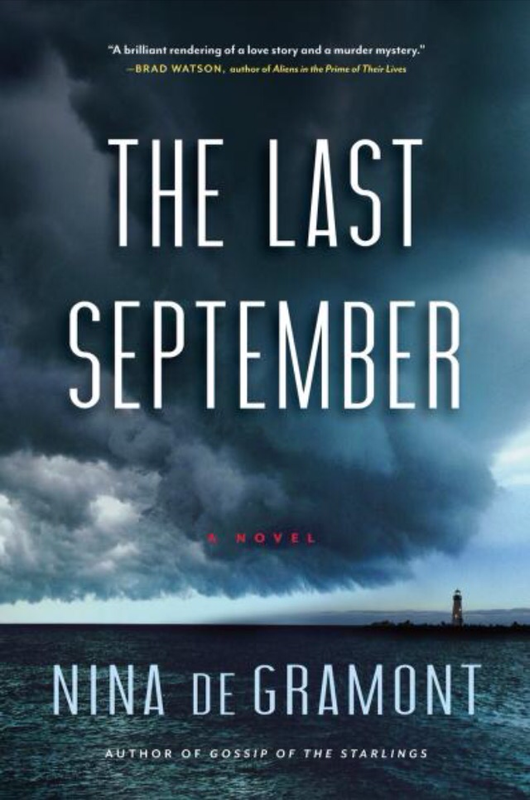 <em>The Last September</em> By Nina de Gramont. While Brett comes to terms with her husband’s death and wonders who killed him—all signs point to the schizophrenic brother—author Nina de Gramont takes us back to explore how Brett and Charlie met, as well as complications in their marriage mostly due to Charlie’s infidelity and inability to keep a job. Brett lived with Charlie in a seaside cottage on the Cape. Meant for seasonal occupation, it’s her husband Charlie’s summer home. Brett fell in love with Charlie during college when they spent one magical night together skiing under the stars in Colorado. Brett had been friends with Charlie’s brother Eli. But Eli suffered a scary and devastating breakdown which scared Brett and he subsequently left college for treatment. Brett becomes consumed by Charlie. Her world revolves around Charlie. Brett works to complete a PhD in 19th century poetry while Charlie doesn’t even read. There are numerous connections to Emily Dickinson throughout as Brett studies 19th century poetry and lived across the street in Amherst from the Dickinson home. It’s a devastating and destructive relationship. Brett loses her sense of self when she’s with Charlie. “And I didn’t just love him. I loved him enough to stop caring about anything else. I loved him enough to wreck my life. I loved him the way you dream about being loved, when you don’t even know you’re dreaming.” But is that enough to keep them happy and together. Is Brett more devoted to Charlie than Charlie to Brett? Did Eli really kill the brother who loved and cared for him unconditionally or is there a third party involved? Nina de Gramont writes excellent characters and a dazzling storyline involving mental illness, family, infidelity, relationships, love and murder. The Last September is one of the best books I’ve read this year. It’s a masterful mediation on relationships.